For one thing, I’m just nuts about roasted beets and love a citrus and goat cheese combo. I have a couple of salads already that have beets and goat cheese; there’s this Arugula, Beet & Goat Cheese Salad, with a Balsamic Vinaigrette. Then there’s my Beet Goes On Salad (sorry about THAT name!) with an out of this world Honey Citrus Vinaigrette. But I really got it in my head that I wanted to try my hand at a version of this salad with that Orange Balsamic Vinaigrette. I couldn’t get over thinking about this lovely salad and what I imagined to be a robust Orange Balsamic Vinaigrette drizzled atop, adding such flavor and freshness. It seemed like it would be just the perfect thing for a cold January day; a bit of sunshine. And maybe just a bit different than most salads I’ve had. It’s quite a mix-up. I haven’t ever actually had this salad at Cubby’s, but that wasn’t going to stop me from using that description for inspiration. And of course, since I love mixing up my own Salad Dressings, I just knew the Orange Balsamic Vinaigrette had enough flavor to stand up to a Spring Salad Mix. It has enough acidity enough to offset the sweet Mandarin oranges and cut through the buttery richness of the avocado in that salad, while the peppery component accents those beets. Unfortunately, when I went to the store, the Spring Salad Mix was crazy pricey and just didn’t look good at all! So in went half a head of Romaine. I wanted to roast my own beets, too, but they were going to be about five dollars for two! I got a can. I’ll tell you more about that, later. And I had planned on using actual oranges in the salad, but didn’t realize until I zested my orange and then ate it on the spot (the smell of zested orange is intoxicating!) that I didn’t have another orange for the salad, so in went the can of Mandarins. But that goes to show, you’re never set in stone in following exactly, a recipe and it was still delish! Let’s talk about these Beets. See, beets and I had a rough start. As a child, we always had canned beets on a regular basis as a part of our hot lunches at school, and they just left me cold. It wasn’t until I was an adult that beets started to rock my world, and that was because I learned how to both pickle (Here are my Grandma’s simple one jar Refrigerator Pickled Beets) and roast beets. The directions for roasting are in the recipe, below. I bought a can of beets for 69 cents, and they were just as awful as I remembered from childhood, mushy and bland. I had a brainstorm & I drained my canned beets, patted them kind of dry as best I could, laid them on foil on top of a sheet tray, tossed them in my Orange Balsamic Vinaigrette. In to the oven they went at 400 degrees F. for about 10 minutes, then I turned them and roasted a few more minutes. Just watch them carefully because ovens and timing can vary. They shrunk just a bit and the flavor and texture was much improved. They were delish! Toss your avocado, too, in just a little of the vinaigrette so it doesn’t turn brown; there’s enough acid and citrus to keep them beautiful and green. Salads like Cubby’s Beet & Goat Cheese Salad are so versatile; let what looks good and what has a great price be your guide to what you put in it. Mixes, like the Spring Green Mixes are so good and have so much variety, it is hard to recreate at home without buying all the lettuces in it. Ounce for ounce, they’re about 4 to 10 times as much as loose lettuce, too. We do have a few stores with open bins where you can mix and match your own, but honestly, good old Romaine (and it isn’t the only green that has issues with recalls) is a budget standby. Rinse, rinse, rinse under cold running water and keep it cold! It’s not enough to swish or use a salad spinner and you never want to drop anything in a sink of water. Sinks are the worse offenders as far as cleanliness. Watch for avocados on sale; if the price is great and they look awful, ask when the next shipment is coming in. Pick them up at a variety of hardness and you’ll have avocados for a week or two. Fresh oranges are so much more inexpensive than Mandarins in a can, so shop well for them, especially from January through April when so many varieties are in season and available at a low. Pistachios can be pricey! Know your nuts, shop for them over the winter holidays and freeze them where they’ll stay fresh for months. Honestly, I prefer to buy pistachios in the shell – it slows me down if I feel like snacking on them. A salad like this is a great place to sub in the more affordable almonds. Add well-washed Salad greens to a large bowl. 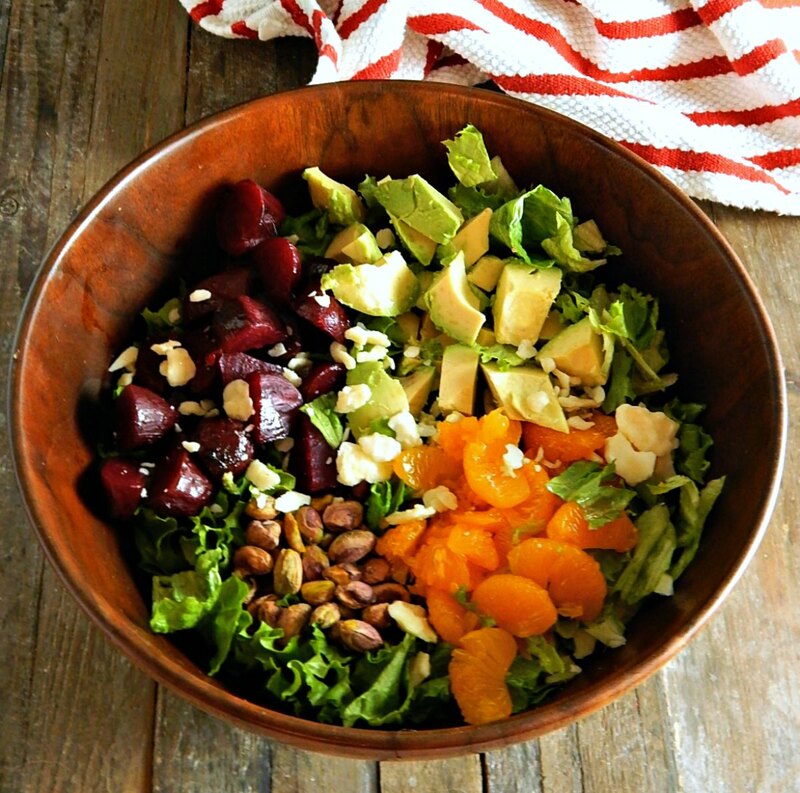 Top with avocado, beets, oranges, and pistachios. Drizzle with dressing and toss before serving. To roast beets, wash, remove greens but leave root end intact. Place on a sheet of foil and wrap well, closing at the top. Place on a pan and roast in a 350 degree F. oven for about an hour. Open package carefully, let cool. Slip off skin with a vegetable peeler or paring knife. I’ll be sharing my Cubby’s Beet & Goat Cheese Salad at Fiesta Friday #260, hosted this week by Diann @ Of Goats and Greens and by Moi! Stop by and visit and see what this special link party is all about. This entry was posted in Click here for Bargain Meals, Click here for Fabulous Food Posts and tagged Avocado, Beets, canned beets, Lettuce, Mandarin Oranges, Nuts and Seeds, Orange, pistachios, Salad. Bookmark the permalink. You’ve been quite busy recently! This salad would make my day, and once again, thanks for bringing this dish to Fiesta Friday, and for your co-hosting! Thanks, Diann! It’s a great salad! Not only is this absolutely beautiful, it looks delicious and very healthy. I just love beets and goat cheese together. A flavor combination made in heaven. This salad looks really yummy, Mollie! If you added jicama, it would bring memories of the traditional Mexican Christmas salad. I loved your improv, especially roasting the canned beets! Hi Irene, thanks! I love jicama – the crispness is so fun! And surprisingly we do have it right at the grocery, even in the dead of winter in Minnesota! I had to look it up, Ensalada Nochebuena! What a happy post – loving the colors and freshness of the salad. What a great combo, love beets and love goat cheese. Thanks! I love goat cheese, too. I don’t get why some ppl don’t like it but more for me, lol!! I will have to try your roasted canned beet trick! I love roasted beets but hate dealing with them. Goat cheese is my favorite and it was impossible to find it in this two-story town until a deli moved in last year and started stocking it. Yay!!!! When I was helping the folks out or visiting my sister, I felt like I was “crippled” when I wanted to make stuff! Excellent tips on keeping this delicious looking salad cost effective! It would just be great at any price, but man is it a fun winter salad! Thanks! I’m a sucker for anything with avocado in it, for one!! And beets, lol! oh my goodness this looks amazing and it has beets! i LOVE beets! thank you for posting this.